Thread: What chain plays best with Endless rings? Good morning fellas, Just picked up an Endless ring and KAC and am wondering what chain you would suggest to keep the wear on my rings minimal? 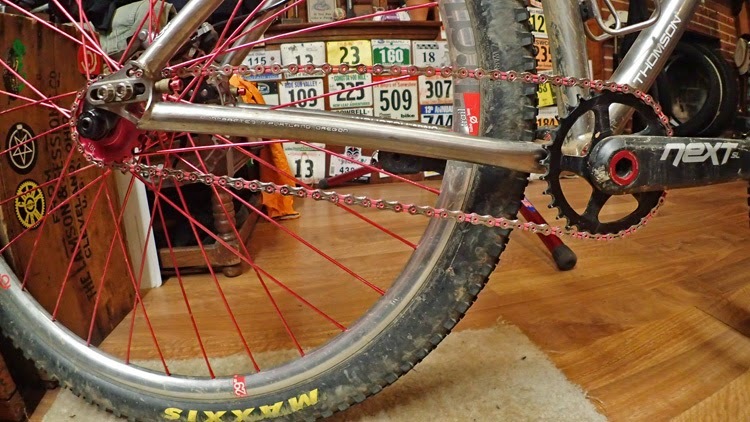 I currently have been using some half link bmx chain but It weighs a million pounds and makes trail side repairs a bit more difficult. Any suggestions? The reason for going with 10 speed chain.....I feel that companies are still pouring in R & D into the 10 speed products. Finding ways of making them stronger/lighter/more reliable.....Whereas 8/9 speed chains are just rolled over from year to year. Not a lot of new advancements going into 8 spd chains. I know I break far fewer 10 spd chains than 8 & 9 speed chains combined. Awesome, thanks for the input guys. I use a KMC X9 SL chain. I tried a ten speed chain on my KAG, and it was a little tight... until it wore into the sides of the cog. Slightly binding. Strange wear patterns. I use SRAM 8 speed on mine. 9 bucks does not break on me either... .
On the way to looking up the Wipperman study again, I came across an article from an online bike magazine that torture-tested a series of 9 speed and 10 speed chains, seems like the 10 speed chains did better by a wide margin. I probably shouldn't be such a cheapskate, 11 bucks for an 8spd chain is a good deal, but 30 bucks for an XT 10spd chain is a pretty good value all things considered. I did remember correctly that out of shimano, SRAM and KMC, shimano did the best in the wipperman study. Of course wipperman blew them all out of the water, which kind of makes me want one. I wonder if a stainless chain would eat into the KAC more quickly? Should also probably mention that your ring might be designed for the narrower chains, I know r/f specs 9-10-11 spd chains. Might not make much difference on a well aligned ss rig but dang, there is a good argument for a 10-spd chain, I'll admit it. Before posting this here, I emailed Shanna (Owner of Endless) what her preference was. She emailed me back yesterday and said she uses almost exclusively KMC Z410 chains because they are strong, cheap, and come in every color of the rainbow. Her other suggestion was to use 9 speed chains as 10 speed chains develop a weird wear pattern on the cogs (per many of her customers/dealers).